Height/Weight: Since we had BIT’s 4 month check-up this morning, I can report that her official weight is 15 lbs 3 ounces (81st percentile) and height is 26.5 inches (99th percentile). 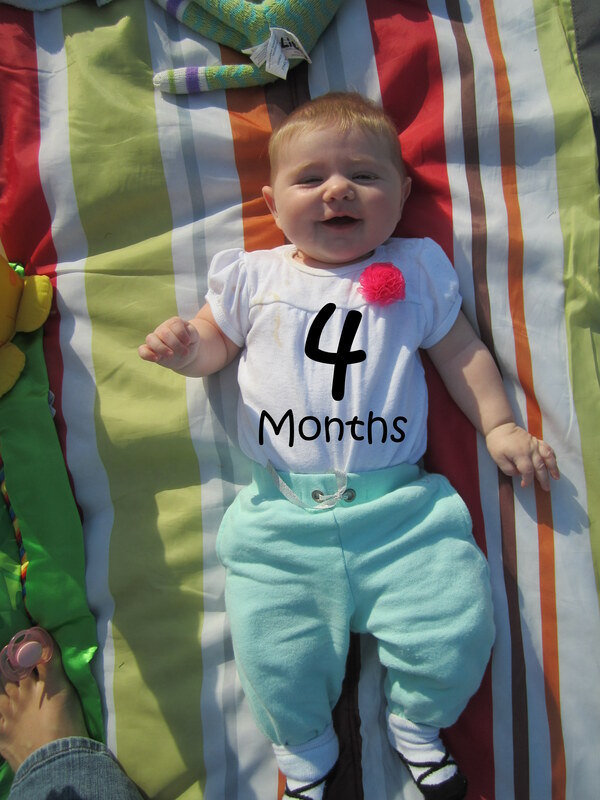 She’s still lagging behind a bit, so to speak, on her head circumference, which is 16 inches (40th percentile). LB had the same lackadaisical attitude toward head growth as an infant. Apparently it runs in the family. Eating: The Brewster-In-Training is drinking 5 ounces every 3 hours. Again, with daycare, they feed her “on demand” – so sometimes it’s 2 hours and sometimes it’s 4. 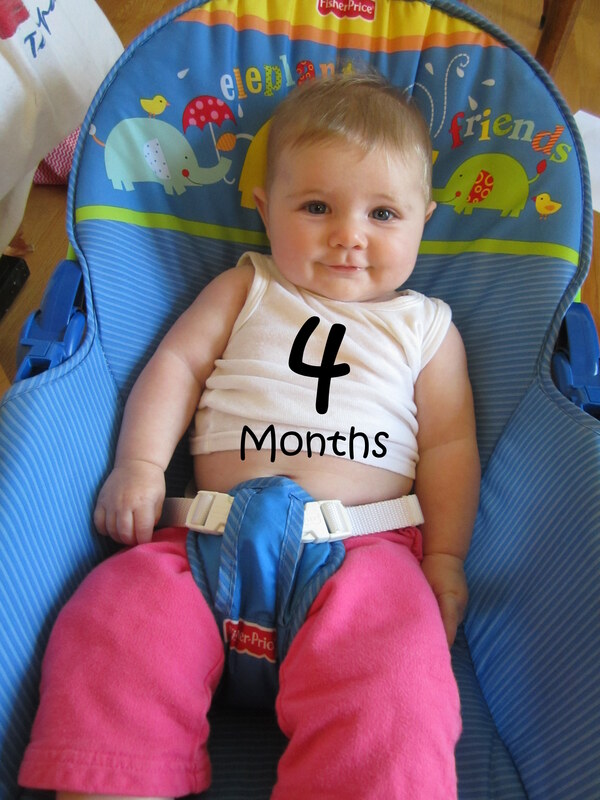 Now that she’s 4 months old and holding her head up pretty well, we’ll probably do a few tastes here and there of solids. We’ve actually given her little dabs of unsweetened applesauce and sweet potatoes and she seems pretty interested. I’m not as anxious to get solids started as I was with the Littlest Brewster, so we’ll probably stick with tiny tastes for the next month or so. And yes, we will be making all of our own baby food again. Sleeping: BIT seems to like 3 naps a day at daycare, usually about an hour long. (This could be because she simply can’t sleep longer with all of the noise and activity going on there.) At home with us, she’ll take epic 2 to 3 hour naps in her swing. I joke that she’s making up for the weekday naps on the weekend, which may actually be true. She gets pretty damn grumpy when she’s overtired, so I’m not really sure how Ms Portia and Ms Val deal with her during the day. She hardly napped at all for us yesterday and it was rough. I don’t know what we’ll do when she outgrows the swing! At night, we’re still starting the bedtime routine around 6:45 – bath, bottle (if she didn’t eat already), and a cuddle while LB watches 10 minutes of a Disney video. Then I pop her in her crib and she’s usually out like a light. We had been getting some pretty good stretches at night for a while, where DB would dreamfeed her at 10 and then she’d go until 4 without waking up. I don’t know if it was dropping the swaddle or the dreaded “4 month sleep regression” or what, but for 2 1/2 weeks, she was back to being up and hungry every 2 1/2 to 3 hours. She was actually sleeping worse than she had as a newborn. Last night was terrible. She was up at 10, 12:45, 1:15, 3:00, and 3:45. At that point, I took her downstairs and tried putting her in the swing (which usually works like a charm) but she was having none of it. I think she finally fell back asleep on me around 4:30. I know she will eventually sleep from 10 to 6. I just hope it happens before I keel over from exhaustion. New Skills: Super exciting, BIT has mastered the art of rolling over from her back to her stomach. I had read that it’s usually stomach to back first, but BIT laughs at convention. She also grouses at tummy time, which means that there is an inevitable fuss fest when she rolls over onto her stomach and can’t figure out how to get out of such a terribly uncomfortable position. We’re letting her work at it a bit before we go rescue her, but the sooner she learns how to flip back onto her back, the better. She’s also really found her voice and spends quite a bit of time cooing and grunting and making various and sundry baby noises at us. She loves having “conversations” with the DreadBrewer. And her head control is so good, that we went ahead and busted out the Jenny Jump-Up and BIT loves it. She will happily sit in there and nom on her toys or watch the Littlest Brewster play. And speaking of nomming, that’s the final skill BIT is fine tuning with hours of practice. She will shove anything she can get her hands on into her mouth as quickly as she can. Everything is covered in slobber. This causes no end of irritation to LB, as baby slobber certainly makes her own toys less appealing. I fished out the box of baby toys that I had set aside and there are some good nomming things in there. Hopefully, BIT will be content with those and give her sister’s poor baby dolls a rest. And I couldn’t decide which one I liked better, so this month we have two monthly photos! Lucky us! How is she so big already?! I hear you on the tiredness. Hopefully BIT and her little buddy M will both figure out how to sleep better soon. We can remind them of this when they are teenagers, right? At which point we will be not sleeping as we worry about them on their first dates, out with friends, at the football game… I think we may have kissed our sleep goodbye forever when we gave birth!